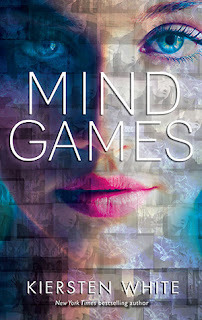 This is my third review for my monthly TBR in May, and I am reviewing Mind Games. This book was one of my most anticipated 2013 releases, and it just didn't live up to my expectations. When I think back on the book, nothing really happened. I think it was really missing out on the "thriller" part of psychological thriller. I felt like the thoughts and events happening to our narrator's were very repetitive as well. I must say, I was getting tired of hearing Fia endlessly announce how she could do nothing in her situation because she had to protect Annie. I get it, I really do, but you can't have ten chapters of just this thought going around in her head. Don't even get me started on the characters (yeah... too late). James was such a jerk that I can't even read about him without shouting violently inside my head and slamming the cover of the book down because I am so angry at how Fia is totally okay with his jerk-ness. Fia and Annie felt very underdeveloped to me. I liked Annie better because her emotions and actions I could relate to more, but both of them could've used work. Because Fia is so damaged, we don't even get to see what she's like as a person (normally) because she's always damaged. Also, sometimes at the beginning I forgot who's perspective I was on (until the writing style with Fia came up... which leads me to the next point). Now the writing style and format. Fia's chapters often had random, unconnected-to-the-real-sentence thoughts in brackets (ow, my arm hurts, my arm hurts), FULL CAPS IN SENTENCES, and lot's of choppy thoughts and frustrating tapping (tap-tap-tap). I think White was trying to go for a unique voice in her character, and a portrayal of how damaged she is, but it didn't work for me. All it did is annoy me and make me want to stop reading the book. Also, the writing format. White alternates very often between past and present-- The past chapters are in no order at all. For example... Fia: Monday Morning, Fia: 7 years ago, Annie: Monday Morning, Annie: 5 years ago, Fia: 4 years ago..... etc. etc. This was very frustrating and extremely disorientating, especially at first. Not only that, but these flashbacks were almost never relevant (I didn't care what happened in them, really) and didn't connect to the chapter before. I think the author was going for a unique approach of slowing feeding in backstory, but personally I would've preferred she just have written it from the past because more than half of the book is past rather than present. So no flashbacks. I know I ranted a lot, but despite this, the idea was good (if not a little unoriginal). But it sounded so thrilling, intense, and action-packed in the synopsis and that's just not what you get. Maybe some will like this, but I don't recommend picking it up unless you're a fan of slower-paced, quirky writing.